It has become a bit of a ritual to “pop in” to a GoodWill store or two during my lunch break. Most times my trips consist of a quick look around and leaving the store empty-handed. I usually go in with a mission in mind, and gravitate toward certain areas: Housewares, Furniture, Records and Fabrics. Even though some days are disappointing, lately I have been running into an interesting phenomenon. Great Vintage items simply in need of a little TLC. It all started with the Vintage Dixie Seating Company Kids Rocking Chair. A great find at a great price only $4.99! 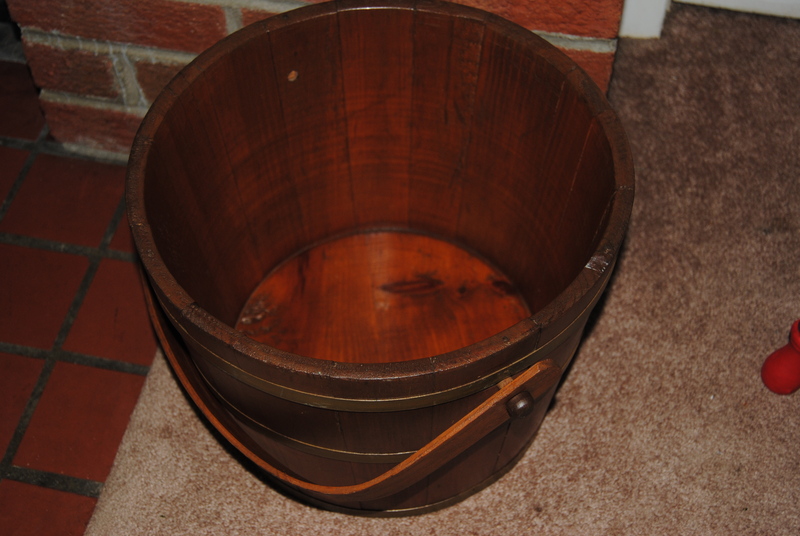 Then I noticed this Wooden Bucket with metal straps that looked like a vintage piece to me. The price was right, only $3.99. It had a few scuffs, but was generally in great shape. I found myself taking it home with no real plans on what I was going to do with it. 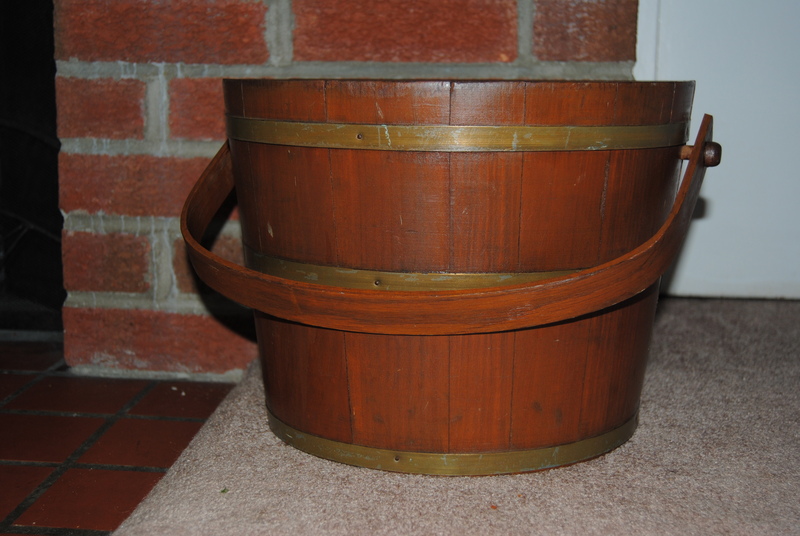 I just really liked it, and I have not seen a wooden bucket like this before. I felt like it was best to keep the bucket in its original state. I cleaned it thoroughly with a damp cloth, removing any dust and dirt. Once dry, I simply used petroleum jelly on a cloth to buff the entire piece. (This works great on wood surfaces) The Vaseline even removed some of the scuff marks and scratches. It cleaned up great, and the inside is in excellent condition! A great find that just needed a little love. 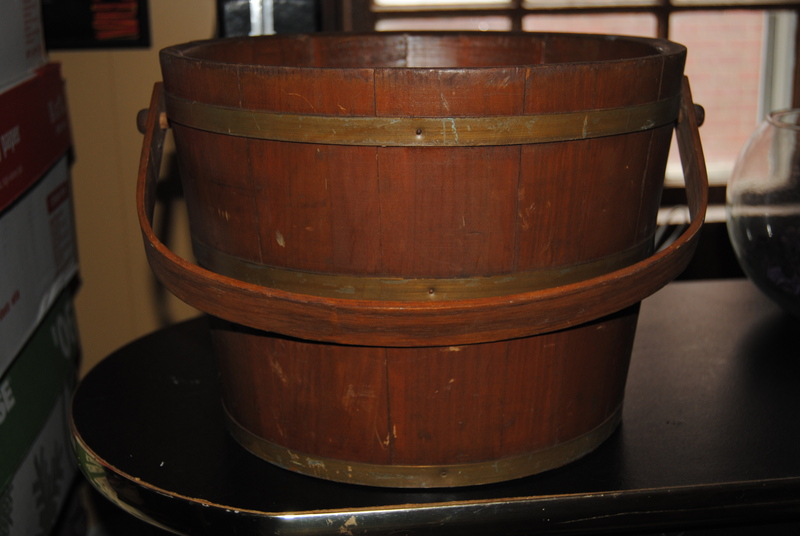 The uses for this bucket are endless, but for the moment this sits on my fireplace mantle. It’s nice little finds like these that keep me coming back for Goodwill lunches! I’m a lunch-break Goodwill shopper too!